LAS VEGAS – For Weston Rutkowski, Saturday was more than redemption. It was a mission accomplished. 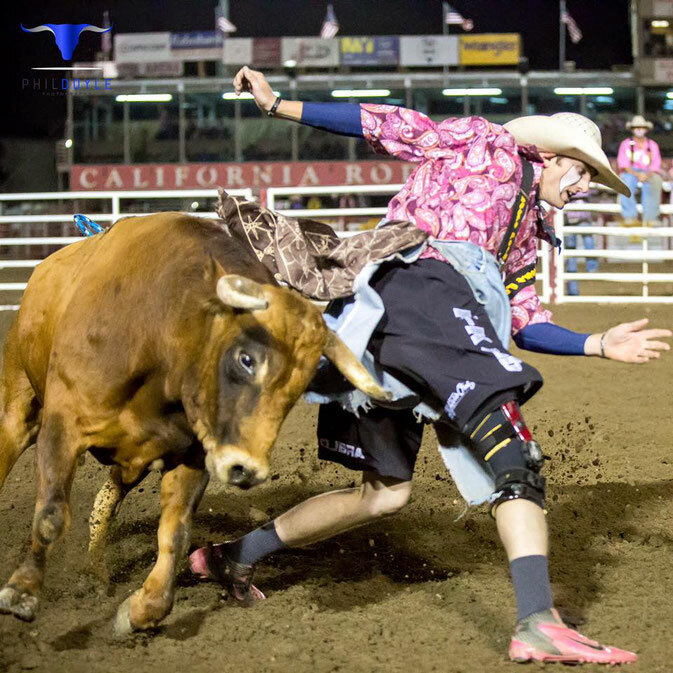 Rutkowski is a 27-year-old freestyle bullfighter who is chasing the first true world championship in nearly two decades, and he made a big move toward that by winning the Bullfighters Only Las Vegas Championship, pocketing $15,000 and grabbing the title belt. He put the finishing touches to a marvelous run in the City of Lights with a 90,5-point fight with 12x and Costa Fighting Bulls’ Bad Intentions on Saturday morning at the Hard Rock Hotel & Casino. 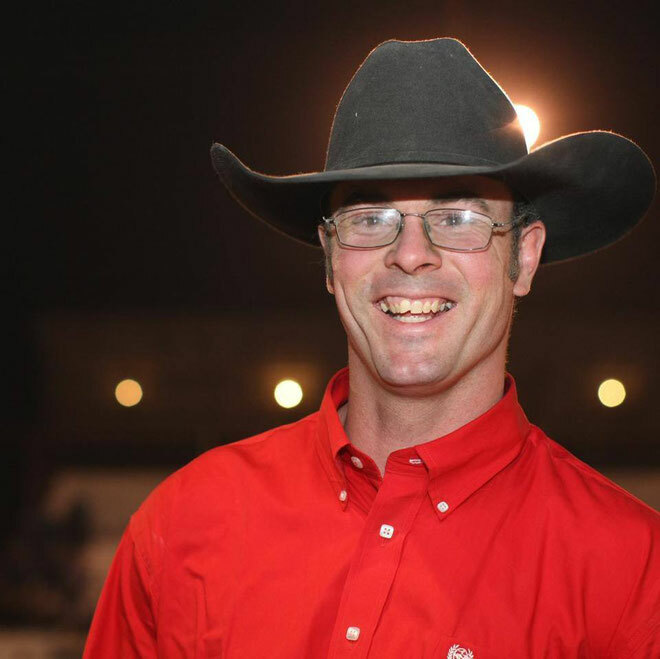 He finished his stay in Las Vegas by earning $21,500 – he won his second straight Roughy Cup last week, worth $6,000, and also collected $500 for winning his first-round set this past Wednesday. That pushes his season earnings to $41,825 and gives him a commanding lead in the race toward the inaugural Bullfighters Only world title. “This is the next step,” Rutkowski said. “Every day is a new goal. I’m going to celebrate this one, because I came here with the mindset to win both of them. The Las Vegas Championship was a tournament-style competition. Nine men qualified for Saturday’s final day, which featured three three-man bouts. The winners of each set advanced to the short round. Rutkowski posted the highest score of the opening round with an 87-point fight to advance. It worked, and he was matched in the championship round with Nebraskans Beau Schueth and Zach Call. That’s when Rutkowski stepped up his game with Bad Intentions, starting the fight with his back facing the bull, jumping up and allowing the animal to run between his legs. “It’s called the Ol' Swoosh,” he said of the move. “Chuck Swisher and Dusty Tuckness came up with it a few years ago. I haven’t done that move since 2014. Those sacrifices are paying off in a big way. 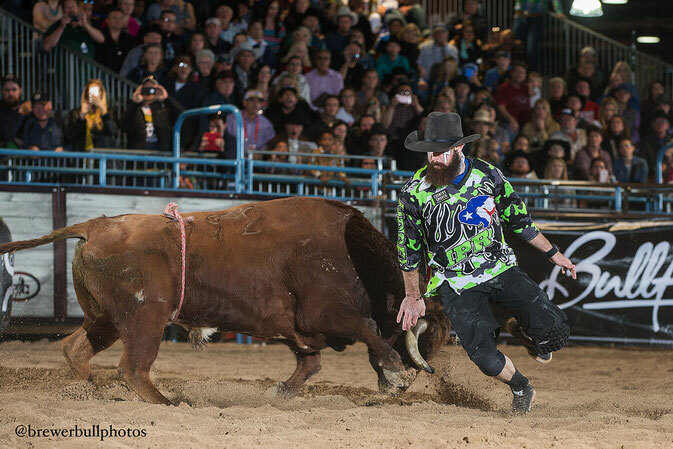 LAS VEGAS – Zach Call felt like he left some points on the board in his first-round bout at the Bullfighters Only Las Vegas Championship. He made sure that didn’t happen Friday during the event’s Wildcard Round at the Hard Rock Hotel & Casino. The Mullen, Neb., man dominated the first round of the Wildcard with an 85.5-point fight to advance to the day’s final round with Toby Inman of Davis Junction, Ill., who had an 85.5 in the second round. It was a head-to-head match between the young gun Call and the veteran Inman, with only the winner moving on to Saturday’s BFO Las Vegas Championship finale, which takes place at 11 a.m., also at the Hard Rock Hotel & Casino. It will be followed by a “sessions” performance at 1:30 p.m.Tickets for the final day of the BFO Las Vegas Championship are on sale at HardRockHotel.com and AXS.com. He got them Friday, especially in his final battle with Sid Vicious. In fact, both Call and Inman were hooked by their bulls in the final round. Call was the first to go and had a strong fight through most of his 60-second bout. It was only at the end that Sid Vicious dumped him to the ground. 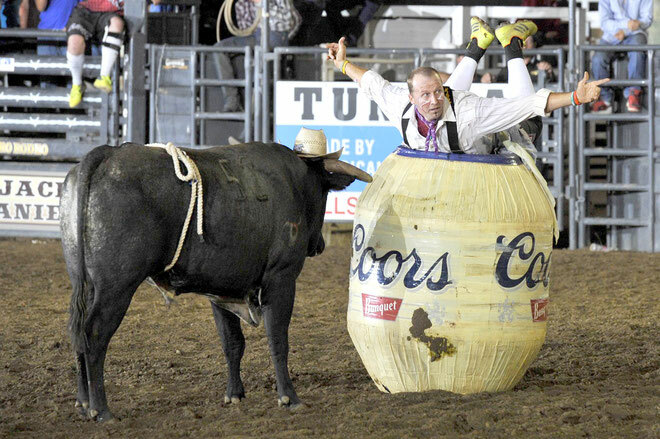 True to form, Inman started his fight with a back flip over his bull and stayed close to the animal. He was dumped to the ground twice in his 85.5-point battle, but he continued to go after the animal. In the survive-and-advance, tournament-style format, both men knew they needed to pull out all stops if they hoped to be in Saturday’s championship. He did, and he has one more chance to prove himself against eight more of the best bullfighters in the sport. Four men advanced to Saturday’s finale, three more will move on to Friday’s Wildcard and one man was injured and could not finish his fight. When the smoke cleared, Beau Schueth posted the highest-marked fight of the day with an 88.5-point bout to advance past Cody Emerson. “It’s amazing for a big hotel like the Hard Rock Hotel & Casino to back us like this and to set up a place on their property,” Schueth said. 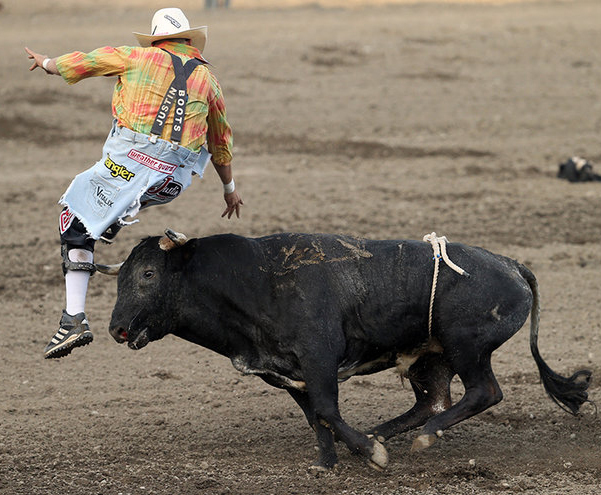 “It’s probably one of the funnest bullfights I’ve been to up to date. Everybody pulled out the stops for this deal. 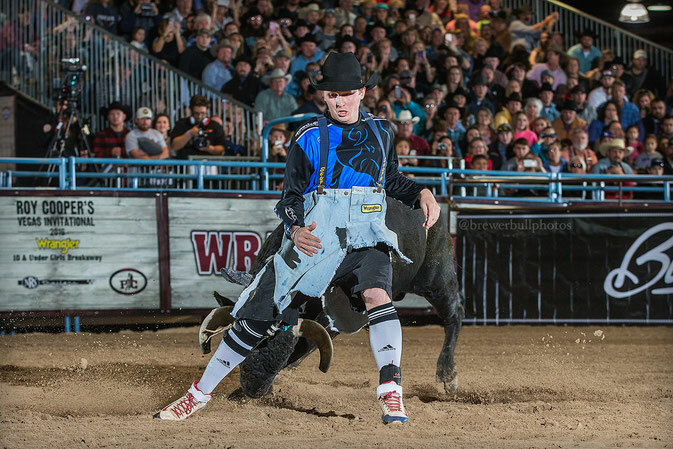 LAS VEGAS – Weston Rutkowski was so focused on his bullfight Wednesday, he doesn’t recall a thing about it. 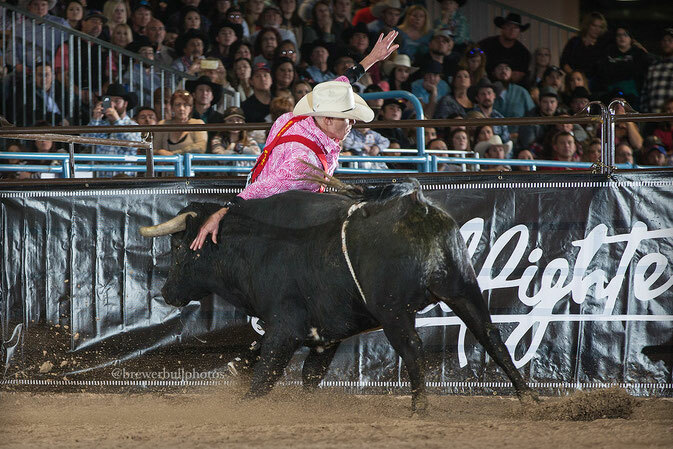 “I just blacked out and went into game mode,” said Rutkowski, who scored an 88.5-point fight during the first round of the Bullfighters Only Las Vegas Championship at the Hard Rock Hotel & Casino. It is the highest-marked fight so far in the opening round with the remaining four bouts scheduled to take place at 1:30 p.m. Thursday. Rutkowski is one of four men who advanced to Saturday’s championship round, joining Tate Rhoads, Kyle Lippincott and Daryl Thiessen. While that foursome is set for the final-day battle, the other four will advance to Friday’s Wildcard Round, where just two will move on to the championship. “I’m ecstatic to make it to Saturday,” Rutkowski said. “I came into this thing with the right mind and set to go to war, not just for today but for two more bulls in a few days. Rutkowski advanced in the tournament-style format by upending Jon Roberts, who had an 80.5-point score. Rhoads scored 83 points and moved on when his opponent, Wayne Ratley, was injured and couldn’t finish his fight. Lippincott scored an upset with an 82-point fight to beat Nathan Harp. The tightest match of the opening day of the BFO Las Vegas Championship was between Nebraskan Zach Call and Thiessen, a Canadian. 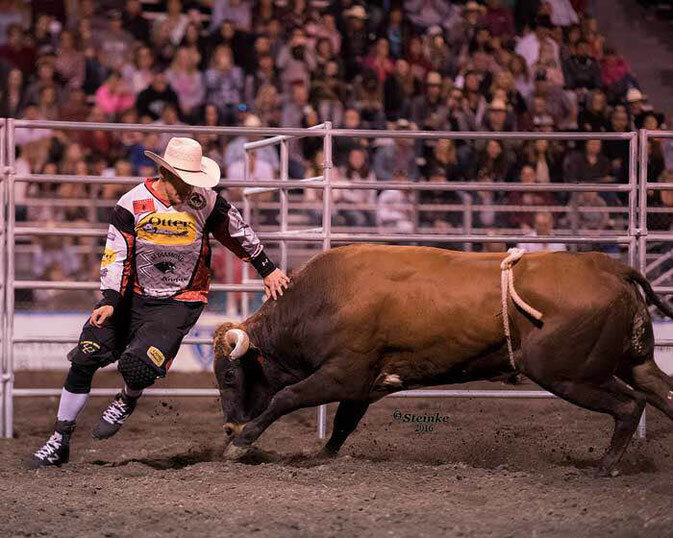 Both men scored 83 points, and it was to come down to a tie-breaker based on bullfighter score, which also was the same; Thiessen advanced via a coin flip. “This is the BFO, where dreams become reality,” Thiessen said. Not only is the event a series of head-to-head matches, it is truly a battle of man vs. beast. It is a dangerous dance in the dirt, and the proof came in Ratley’s fight. He took two severe hookings, with the second knocking him out of the competition. He is scheduled to fight in Friday’s Wildcard. While that 88.5 was the best, the key is just having a better score than the other bullfighter. “Points don’t mean anything,” Rutkowski said. “I still had to handle my bull to the best of my ability. I was very blessed with a good bull. Tickets for the final three days of the competition are on sale now at www.HardRockHotel.com and AXS.com. 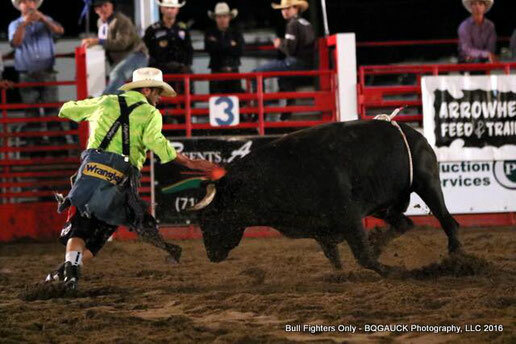 LAS VEGAS – An unprecedented calm came over Daryl Thiessen on Saturday afternoon as he entered the bullfight arena. He should. 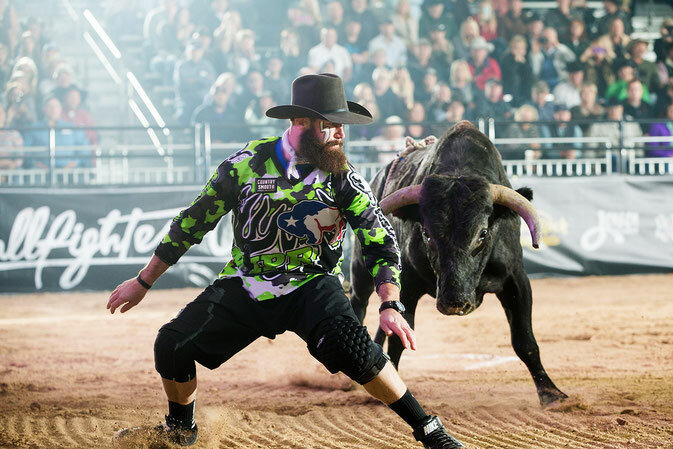 He matched moves with WAR Fighting Bulls’ Captain Hook for 80 points to win the first of two Bullfighters Only qualifiers. He was joined by Travis Gidley of Grandview, Texas, who scored 86.5 points while matching moves with WAR’s Punisher to win the second qualifier. Now they will move on to fight at the BFO Las Vegas Championship, which takes place Dec. 7-10 at the Hard Rock Hotel & Casino. Tickets are on sale now at HardRockHotel.com and AXS.com. “I busted him down really good to start with, and he kind of ran off. I got his attention again, and then I just stayed with him,” Gidley said. 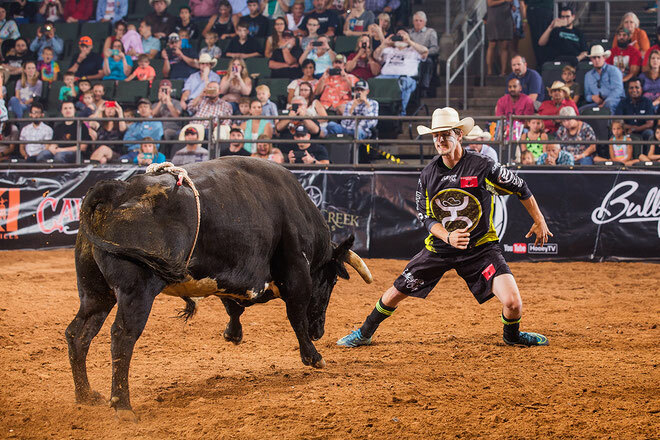 Now both Thiessen and Gidley hope it clicks next week when they will be matched with the best freestyle bullfighters in the business during the BFO Las Vegas Championship, the richest freestyle bullfight in the sport’s history. Both men were in Las Vegas last December during the inaugural BFO event. Neither had the success they had hoped for 12 months ago, but they put in the work necessary to come out on top this weekend. That approach is the best tactic when an athlete is in the middle with a ferocious, aggressive animal that is bred for this type of fight. It takes a man who has a ton of self confidence to come within an inch or two of flying hooves and pointed horns. “Everything just feels so good right now,” Thiessen said. “It just feels right this time. Before when I was here, my mind was blown. I was a guy from a small town in Canada, and I let the bright lights of Las Vegas get to me. It was overwhelming. Now it’s time to transition it into the final four days at the Hard Rock Hotel & Casino. "Andy is as good of a barrelman as there's ever been. 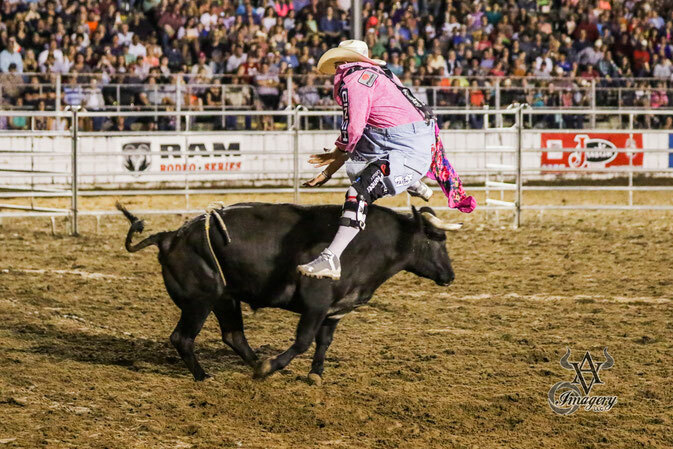 No different from the bullfighters in the BFO, we want to showcase the top talent in the industry," commented Ross Hill, the #2 contender heading into BFO Las Vegas. Additionally, and maybe more importantly, this year the BFO will crown the first true freestyle bullfighting world champion in more than 16 years. “That money’s big,” North said of the $50,000 purse. “I think the location is a big thing. The venues are awesome. Being the time of year – during the same two weeks as the National Finals Rodeo – is one of those things that makes it a true highlight. Everybody’s going to come in and be ready to go. 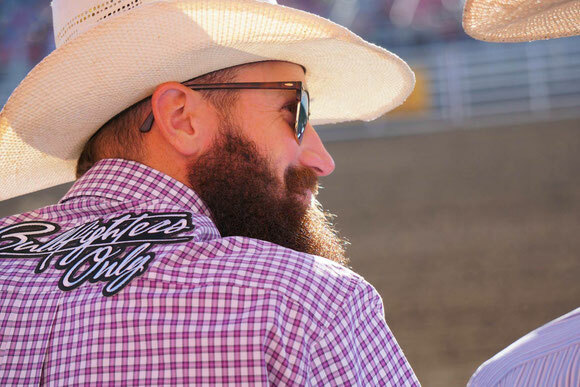 Deifenbach has been face to face with some of the nastiest bucking bulls in rodeo, but now he’s in the fighting bull business. He and his partners - Maunel Costa and Trever Hamsher - have some of the best bulls in the business. Only the best will be in Las Vegas. 12X & Costa will be joined by fellow stock contractors War Fighting Bulls and Hall & Nunez Fighting Bulls, both from Texas. The three firms will supply upwards of 90 bulls during the Bullfighters Only’s Las Vegas Championships, set for Dec. 1-3 and 7-10. That’s the case for 12 men who will do be part of the Bullfighters Only Las Vegas Championship qualifier round, set for 3:30 p.m. Friday, Dec. 2, and Saturday, Dec. 3, at the Las Vegas Convention Center. It’s no laughing matter. 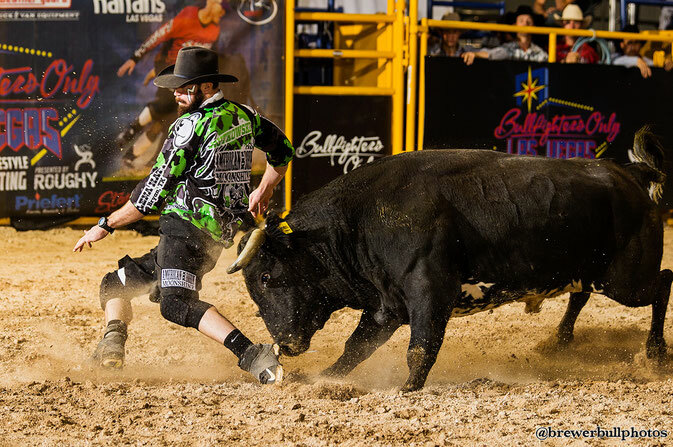 The bullfighters will battle for four remaining spots in the BFO Las Vegas Championship, set for Dec. 7-10 at the Hard Rock Hotel & Casino. Tickets for that are on sale now at AXS.com. Thiessen will be joined in the qualifier by Ross Johnson, Dakota Knight, Erick Schwindt, Arron Reemer, Jon Roberts, Travis Gidley, Tate Rhoads, Kyle Lippincott, Blake Miller, Bryce Redo and Judd Napier. 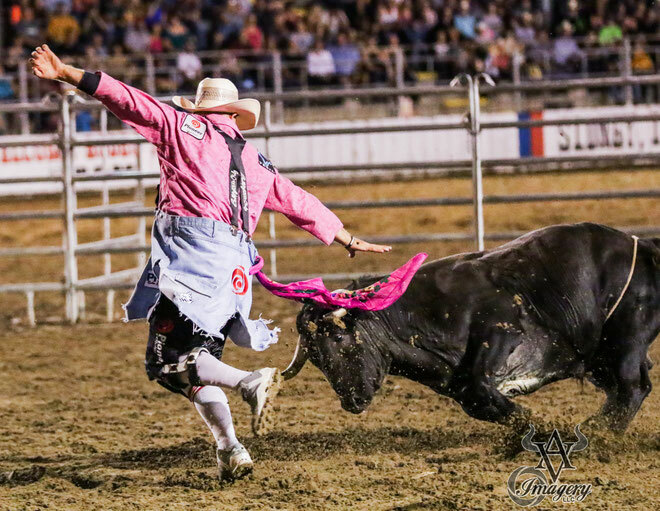 Four bullfighters will advance and be part of the mix that features the top 12 men in the BFO, all of whom received a bye into the second weekend. LAS VEGAS – Last December, the inaugural Bullfighters Only competition in Las Vegas was a skyrocketing success. 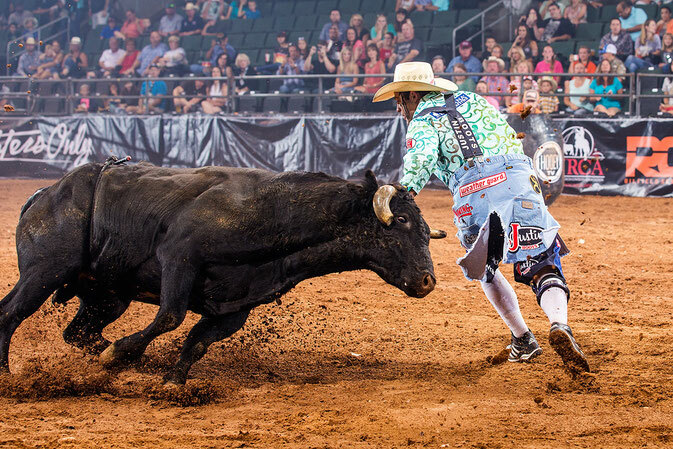 Now the world’s best bullfighters are upping the ante Vegas style with seven days of world-class action. Bullfighters Only recently announced the 12 man BFO Roughy Cup roster who will receive an automatic bye to the BFO Las Vegas Championship at Hard Rock Hotel and Casino. Weston Rutkowski, Ross Hill, Chuck Swisher, Nathan Harp, Schell Apple, Cody Greer, Beau Schueth, Toby Inman, Zach Call, Cody Emerson, Tanner Zarnetski, Wayne Ratley comprise the all-star cast of athletes. The competition kicks off at 2 p.m. Dec. 1-3 at the Las Vegas Convention Center with the BFO Roughy Cup, a 12-man invitational bullfight. 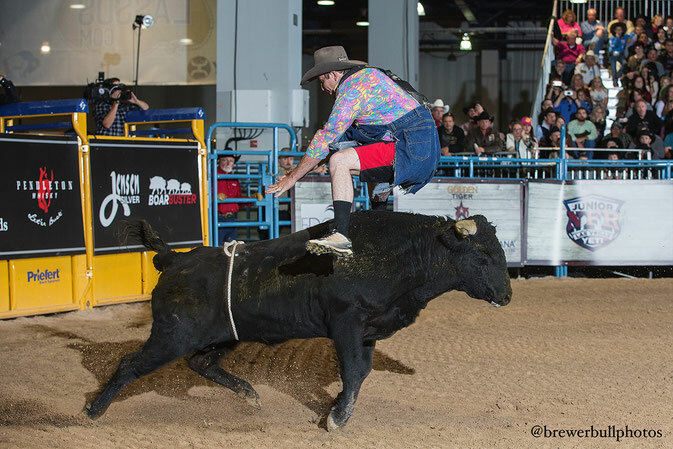 Then on Dec. 2-3, up-and-coming bullfighters will battle to qualify for the BFO Las Vegas Championship, which takes place Dec. 7-10 at the Hard Rock Hotel & Casino. The 12 qualifier contestants will be announced later this week. The opening weekend at the Convention Center is free as a part of Las Vegas Events’ Cowboy Christmas. The final four days of action will be in a new climate-controlled tent on the west side of the Hard Rock Hotel & Casino. Tickets are on sale now at AXS.com. It takes a strong work ethic mixed with amazing talent and true grit to tangle with bulls that possess such speed, power and agility. The bullfighters utilize their tremendous athleticism to “dance” across the arena floor with a partner that is bred to be in attack mode. When the bull is “hot” and on target, the danger is greater, but so are the opportunities to showcase some magnificent skills. Dollars equal points, and all that is gathered in Las Vegas will go toward that championship - another major reason that Vegas is a big stop on the BFO tour. 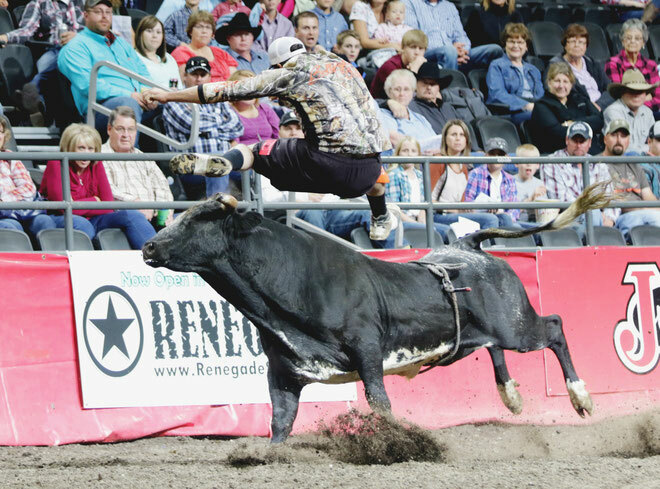 “The money is huge for us, but people really want to see freestyle bullfighting,” said Swisher, who has been working diligently to return to competition after suffering a torn ACL this past summer. “It's one of the most underrated sports, and since Bullfighters Only brought freestyle bullfighting back, people realize that. 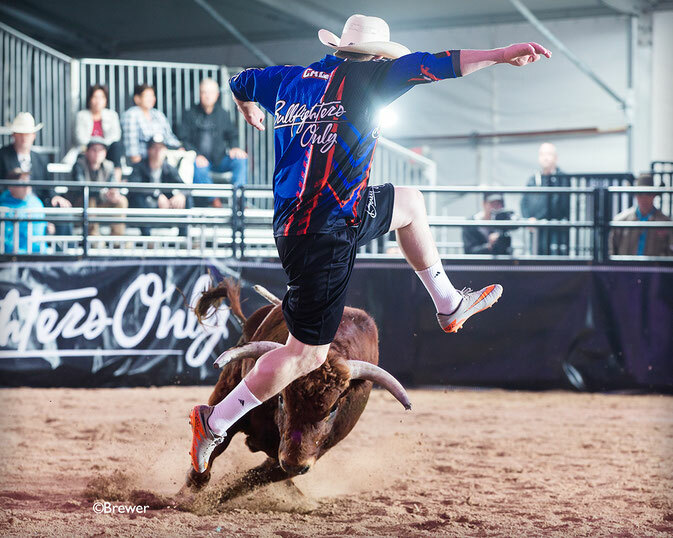 LAS VEGAS, NV – Bullfighters Only (BFO) will present the world’s top freestyle bullfighters at two sites in Las Vegas this December, highlighted by the Las Vegas Championship inside a climate-controlled tent at the Hard Rock Hotel & Casino. Tickets to the BFO Las Vegas Championship go on sale November 8th at Noon CST at hardrockhotel.com & AXS.com. The festivities kick off at 2 p.m. Dec. 1-3 at the Las Vegas Convention Center with the BFO Roughy Cup, a 12-man invitational bullfight. On Dec. 2nd and 3rd, up-and-coming bullfighters will battle to qualify for the BFO Las Vegas Championship, which takes place Dec. 7-10 at the Hard Rock Hotel & Casino. The 12 men selected for the BFO Roughy Cup have earned a bye into the final weekend, where only four men will advance out of the qualifying rounds. The BFO Las Vegas Championship performances at the Hard Rock Hotel and Casino are set for Wednesday, Dec. 7 through Saturday, Dec. 10th. For more information visit www.bullfightersonly.com/las-vegas. “It meant a lot to us to be part of that because it was for the wounded warriors and benefitted that,” said Josey, 21, of Apache, Okla.
Jestes, Tuckness and Webster will first serve as protection bullfighters during the rodeo, then they will be part of the Bullfighters Only competition. “Not only will we show up and protect the cowboys, but we also get to step up for the freestyle fight,” Webster said. 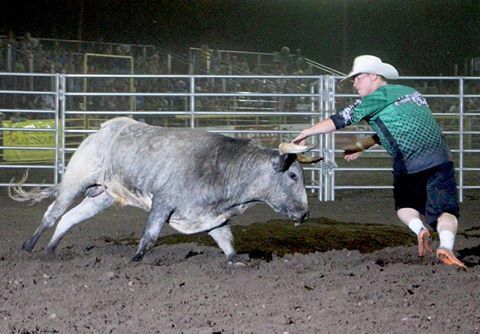 BREMERTON, Wash. – Not much separates the top men from the rest of the field in the Bullfighters Only. 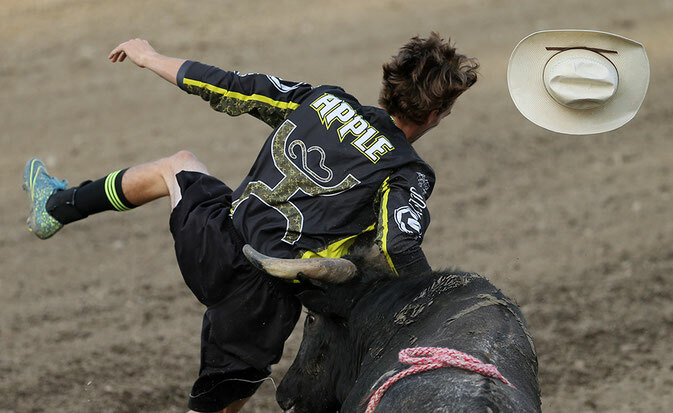 Schell Apple proved that Friday night during the Bullfighters Only competition held in conjunction with the Kitsap County Fair & Stampede, posting an 81-point fight to win the title. 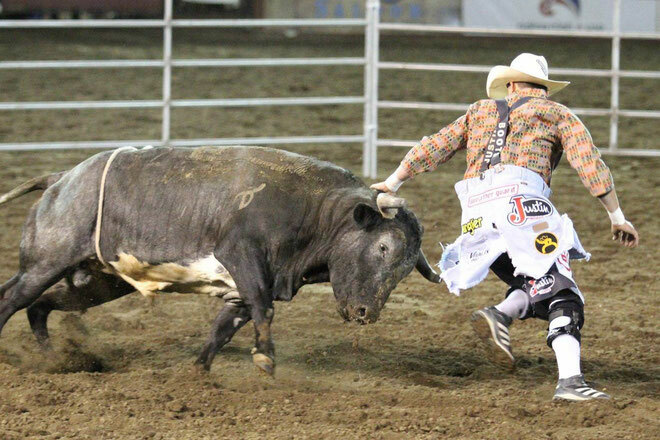 KENNEWICK, Wash. – It’s been five years since Toby Inman looked into the eyes of a bull. 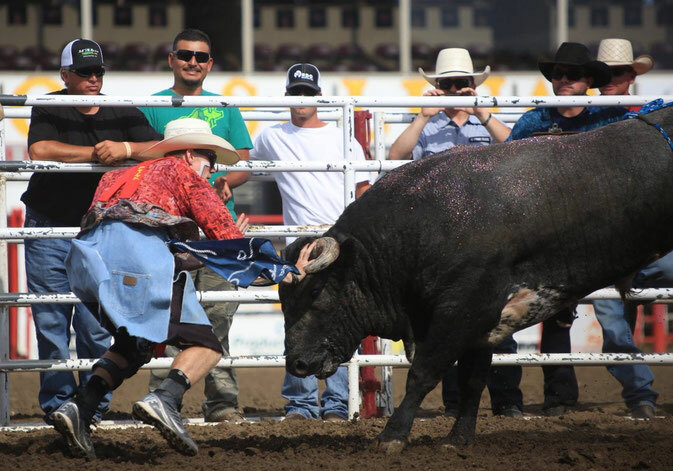 He returns to competition this Friday for the Bullfighters Only tour event that will take place in conjunction with the Benton County Fair and Rodeo in Kennewick. Inman owns Toby’s Tree Service in his hometown, so juggling that with a life in rodeo oftentimes proved difficult. That’s why he’s been away from the game so many years. But he knows the game well. That’s why he’s in the field in Kennewick. He will serve as a replacement for Chuck Swisher, who suffered a season-ending knee injury a week and a half ago. He’s more than capable. In 2011 when he opted for the break from bullfighting, Inman was considered one of the best in the game. 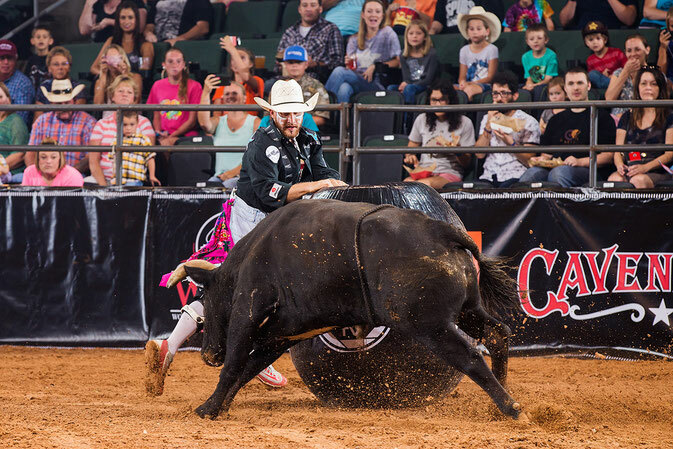 Now he will test his skills in a three-man, winner-take-all bullfight inside Horse Heaven Arena – he will be joined by Zach Call and Justin Josey, the latter of whom is 12th in the BFO standings. It’s a test of talent, mental awareness and the ability to read what a bull is about to do. Is Inman concerned about his stamina? Inman has shied away from the game he loves for many reasons, the biggest of which is handling his tree business at home. He has clients and employees that need his attention. Still he’s excited to see what he can do in Kennewick. “When you have the personality of a racecar driver or a fighter or people that jump out of airplanes, it’s a mentality of ‘Why not?’ ” he said. That mentality served Inman well in the past. There’s no reason it shouldn’t benefit him this weekend in Kennewick. BREMERTON, Wash. – For many young people, a 21st birthday is cause for celebration and for an outrageous party. Schell Apple isn’t like most people his age. 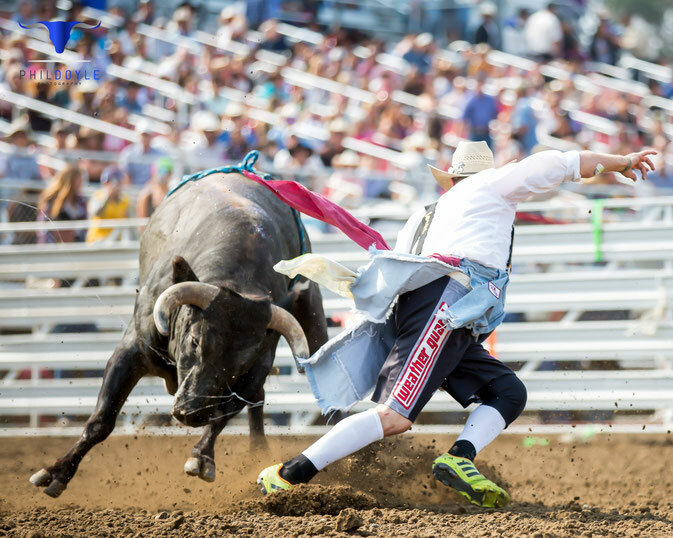 He plans to celebrate a few days early by standing toe-to-toe with a fighting bull during the Bullfighters Only tour stop Friday held in conjunction with the Kitsap County Fair & Stampede in Bremerton. It’s the perfect way to ring in such an anniversary for the young man from Fay, Okla., who attends Oklahoma State University in Stillwater. 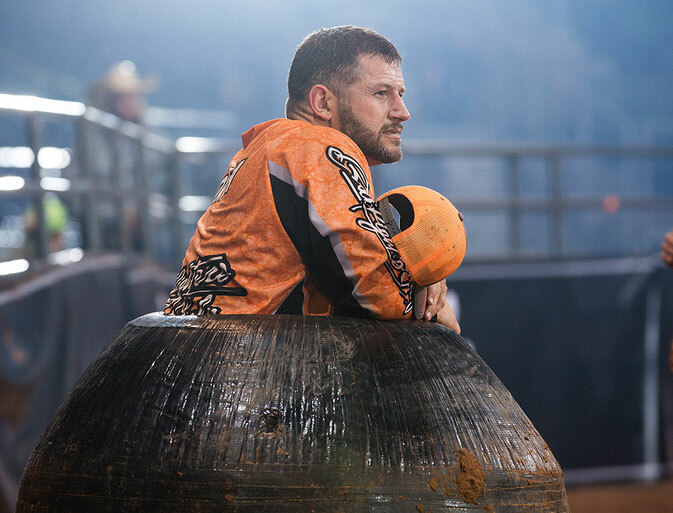 While he’s still young, the Oklahoman is a veteran in the game and has been recognized as one of the top 15 bullfighters in the game. 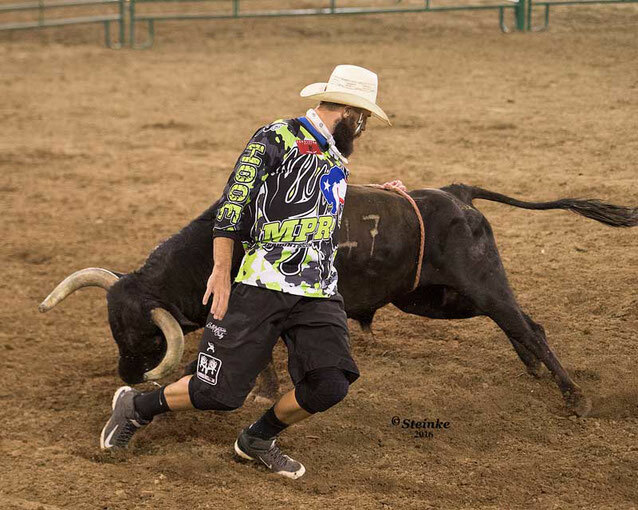 He will be matched with a couple of other veteran bullfighters – Cody Webster of Wayne, Okla., and Ross Hill of Muscle Shoals, Ala. – during the three-man freestyle bullfight in Bremerton. “I think it’s really cool to be able to travel to prestigious rodeos like that and to be able to perform in front of crowds like that and showcase the abilities God has given me,” Apple said. That’s what true athletic competition is like in any arena, especially in the case of Bullfighters Only. In fact, the men themselves were the guiding force behind the creation of Bullfighters Only. It was developed a little more than a year ago, and it has seen rapid growth. That’s been a good thing for the BFO and the bullfighters. “It has taken off ridiculously fast,” he said of the BFO. “I didn’t know a company could get this much momentum so fast. I think it’s awesome. Now it its inaugural season, Bullfighters Only will crown its first world champion later this year. Bremerton is just one of the many stops along the way to deciding which man will earn that title. 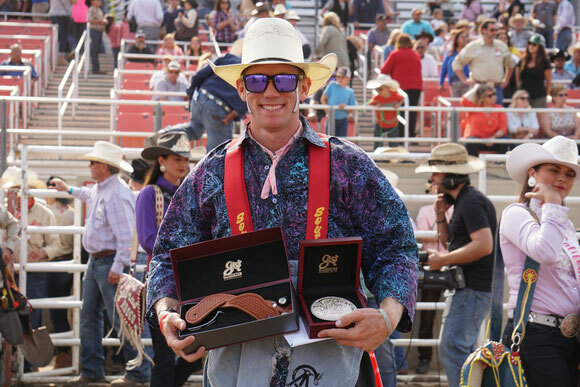 Hill won this past weekend in Gooding, Idaho, so he hopes to parlay that a solid run to close out the season. 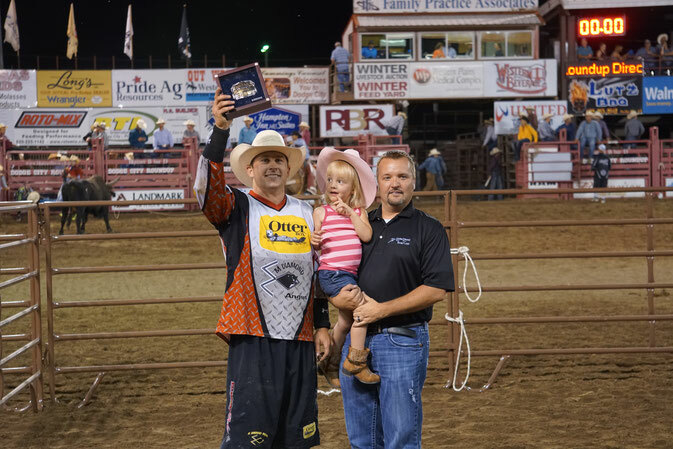 Webster won last week in Caldwell, Idaho, to add to his victory run; he is third in the standings. When it’s a battle of man vs. beast, the bull has the upper hand. That’s why the bullfighters volley with their own athleticism and maneuvers that keep them close to the action and just out of harm’s way. Combined, the danger, the excitement and the speed of a 40- to 60-second fight is an incredible display that fans have enjoyed all season. “I think we as Bullfighters Only have put freestyle bullfighting on a whole new level and on a whole other platform,” Apple said. “Back when they had the Wrangler Bullfights 16 years ago, it was pretty awesome. I think we’ve brought it up to a whole new speed. It’s almost an acrobatic sport now. The four-man bullfight was just what the crowd needed. 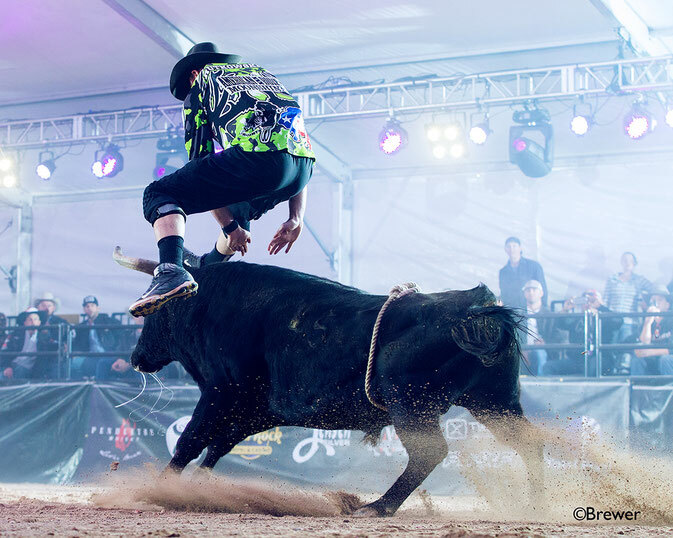 In addition to four of the top men in the world, it also featured the bulls from former bullfighter Darrell Diefenbach and Manuel Costa's 12X Fighting Bulls. From the opening moment, the stage was set. It’s one thing to face danger; it’s another thing to attack it and bring it to its knees. That’s what the Bullfighters Only competition will be about Saturday during the final night of the Gooding Pro Rodeo. Six men will compete in the freestyle-bullfighting battle for the title. SIDNEY, Iowa – Fans in this southwest Iowa community got a taste of freestyle bullfighting a year ago. 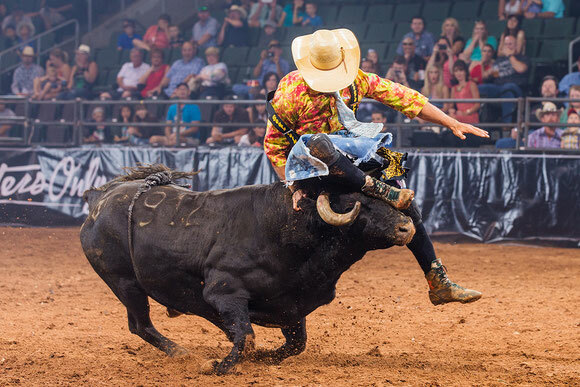 Everything steps up even more this year with Bullfighters Only, which will showcase nine of the elite men in the game during a five-night battle at Iowa’s Championship Rodeo, set for Tuesday, Aug. 2-Saturday, Aug. 6. Sidney marks the 19th stop on the Bullfighters Only inaugural tour. 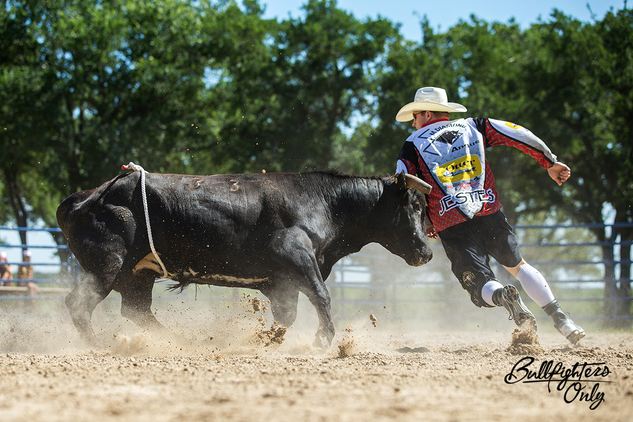 Bullfighters utilize their tremendous athleticism to try to outwit and outmaneuver equally athletic bulls, which are bred specifically for this type of fight. Iowa’s Championship Rodeo has a storied history. Dating back more than 90 years, Sidney’s rodeo has been a staple for many of the greatest cowboys and cowgirls in the sport. In fact, the event was inducted into the ProRodeo Hall of Fame last August. So is the talent these men possess. 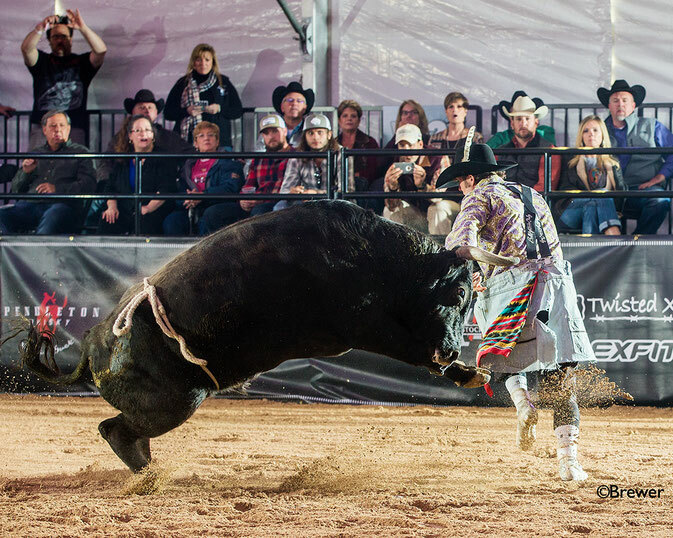 It takes a special personality to not only dance with the bulls, but do it up close. 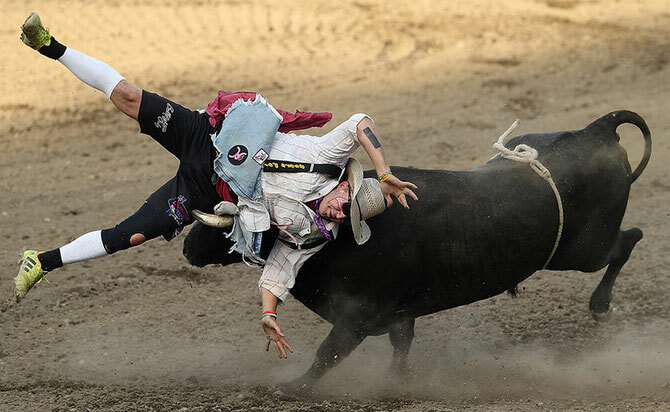 Bullfighters not only engage with the stomping, aggressive and quick animals, but they do so in a series of maneuvers that showcases undeniable athleticism. 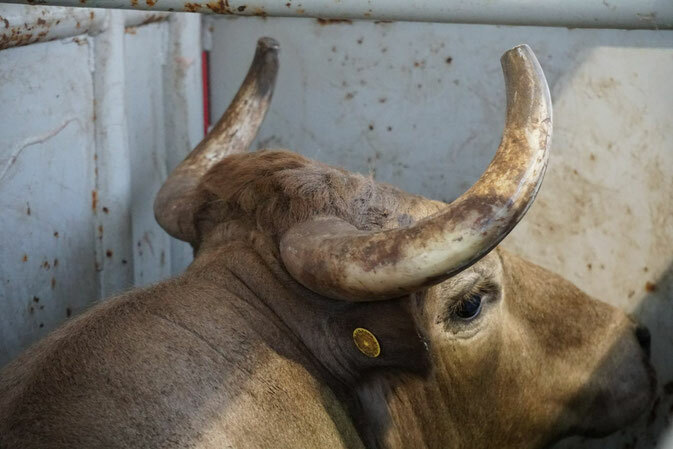 “The bulls drive me,” said Allard, who has been fighting bulls for 11 years. “Just knowing that you’re able to go head to head with one of the fiercest creatures alive and know that if everything goes right, you’re able to control him. When done well, it’s as if Picasso was painting an elaborate image on a dirt arena. There is a fury of movement, and it seems orchestrated; it isn’t. It fact, every movement is done based on instinct and an understanding of what the animal does. It’s a display of man vs. beast, and Bullfighters Only has created a public demand for the sport. That name is well recognized in rodeo, and it’s why Bullfighters Only is part of many of the most prestigious events in the sport. That’s why the best in the business will be in Sidney for five magical nights. 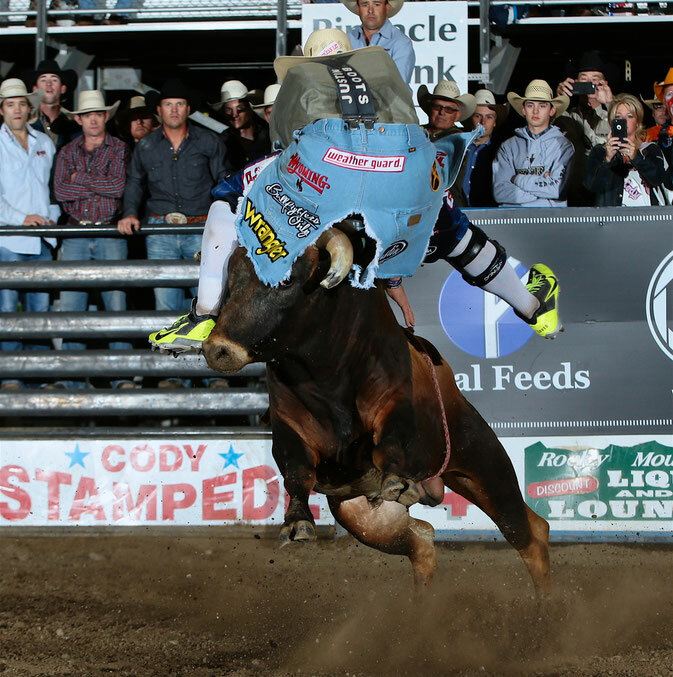 “It means the world to have Cory see me fight or have anybody with that big of a name in rodeo,” Johnson said. “It’s a blessing to have a night like that. As an old bullfighter, the bullfights get him pumped up, too. “Right now, I do some day work and fight bulls, but I want to be able to do this and not have to worry about having a typical job to make ends meet,” said Johnson, 23. “If I could do this full thing, then I’d be living a dream. “Every stop is huge, especially for a guy like me who finally grew into the lead,” Rutkowski said. “I’m not someone who wants to give that up, and I’m going to do all I can to stay on top. My goal is to win the first year tour and be crowned the first true world champion in freestyle bullfighting in 16 years.”. 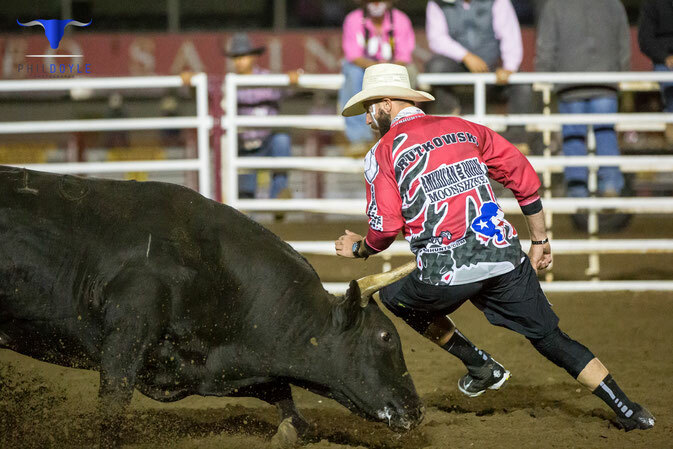 SALINAS, Calif. – Since he first strapped on a pair of cleats and decided that bullfighting was his career of choice, Nathan Harp has wanted to win California Rodeo Salinas. 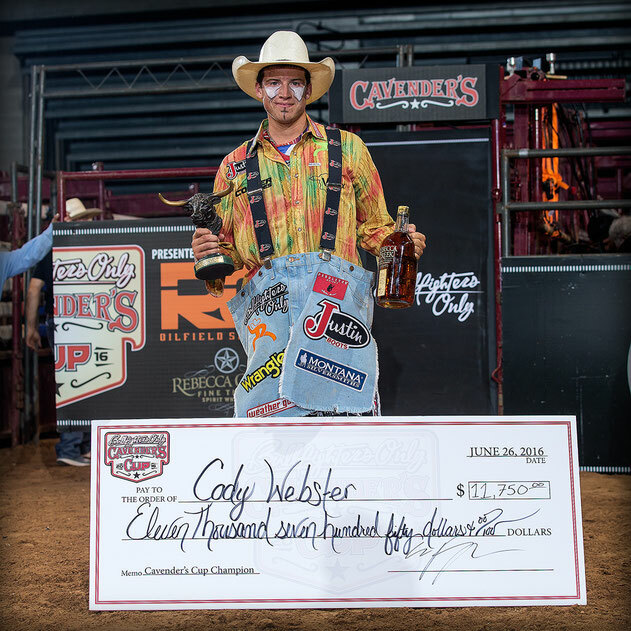 He accomplished that goal over the past few nights of Bullfighters Only competition, winning the championship with a four-fight cumulative total of 325.5 points. He won the first and third rounds, was runner-up in the second round and finished off the week with a third-place finish Sunday. Harp held a one-point lead over Weston Rutkowski of Haskell, Texas, heading into the final day. The Oklahoman posted a 78-point fight to kick-start the afternoon’s competition, and Rutkowski followed two fights later with a 76. The Texan finished second overall with 322.5 points, followed by Ross Hill of Muscle Shoals, Ala., a point behind Rutkowski. Hill, a 10-year veteran of the Salinas fights, won the final round with an 85-point bout Sunday afternoon. 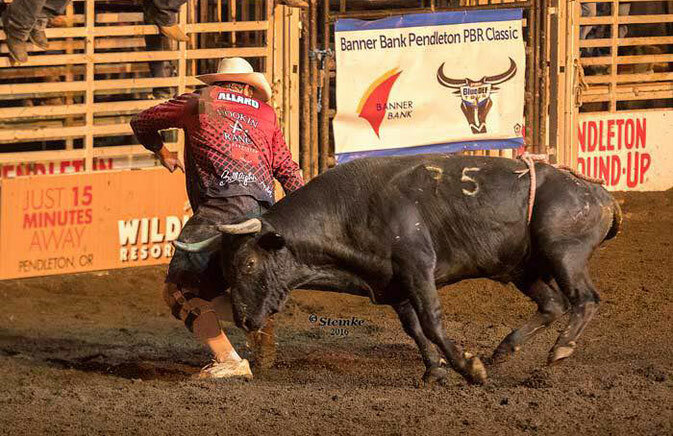 Salinas has been one of the freestyle bullfighting leaders for years, this year teamed with Bullfighters Only, the top 15 bullfighters in the game who are all battling for the first world championship in the BFO’s inaugural season. It helps, too, that the men were matched with great bulls that were bred to be part of this kind of fight. 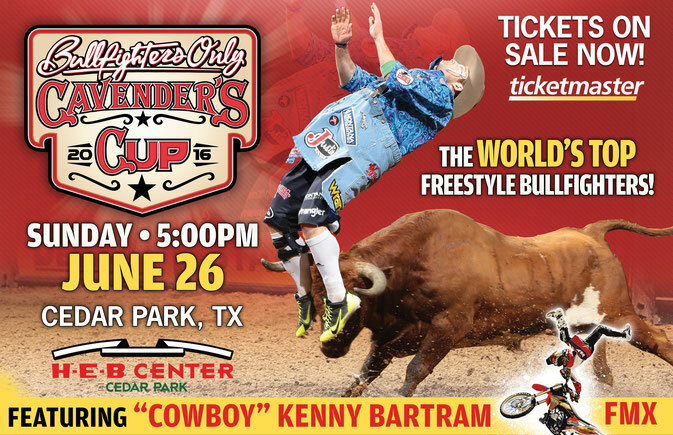 And the competition – featuring six of the greatest bullfighters in the game – makes for a true challenge. Nobody knows better than Harp. 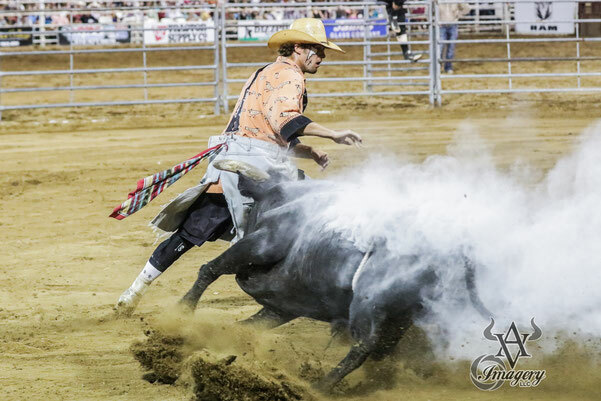 “I’ve had one of my stand-alone freestyle bullfights there before, and they really liked and enjoyed it,” Tuckness said. “Now we’re stepping it up a notch with Bullfighters Only. We’re bringing in (Darrell Diefenbach’s) 12X Fighting Bulls. It’s going to be the best freestyle athletes going.” That makes for quite a show. The BFO buzz has continued to build. That’s why many of the most prestigious events in ProRodeo are on the BFO tour schedule. Events with that much history stand as proof to the incredible showcase that is out there for the Bullfighters Only athletes. In addition to Harp, the all-star lineup also includes the likes of Dusty Tuckness, Cody Webster, Weston Rutkowski, Chuck Swisher, Ross Hill, Cody Greer, Schell Apple, Beau Schueth and more. 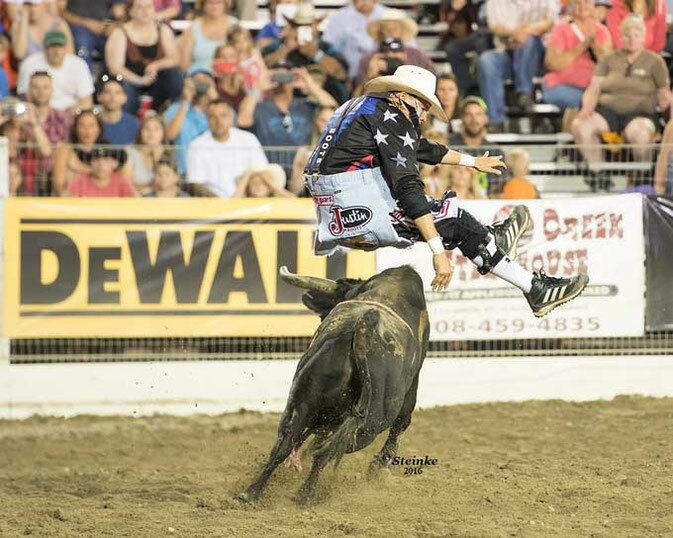 In fact, it turned out to be a winning combination for Rutkowski, who scored 88 points to win Wednesday night the Bullfighters Only event that took place in conjunction with the Reno Rodeo. Bullfighters Only is still in its infancy. In fact, the organization just celebrated its first year in existence, and oh, how that toddler has grown in such a short amount of time. “What’s cool about Bullfighters Only is that the top 15 guys are part of what we call the Pioneer Project,” Jestes said. “It’s 15 of the sport’s best. We’re in it for each other and for the sport of freestyle bullfighting. No matter who wins, we’re happy for each other. It’s pretty amazing.”. 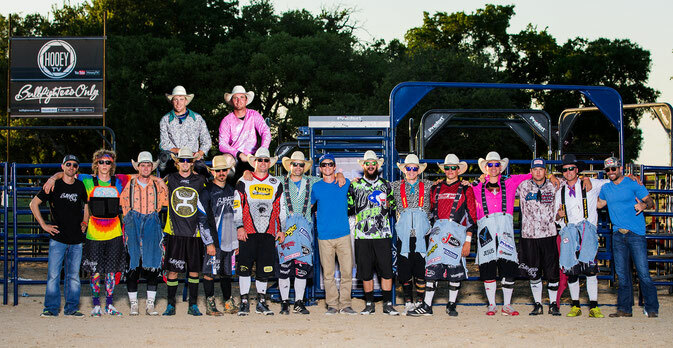 Top: Logan Blasdell, Evan Allard Front: Justin Jacobucci, Justin Josey, Beau Schueth, Schell Apple, Zach Flatt, Nate Jestes, Dusty Tuckness, Aaron Ferguson, Weston Rutkowski, Nathan Harp, Cody Webster, Chuck Swisher, Cody Greer, Ross Hill, Joey Austin. Missing: Erick Schwindt. 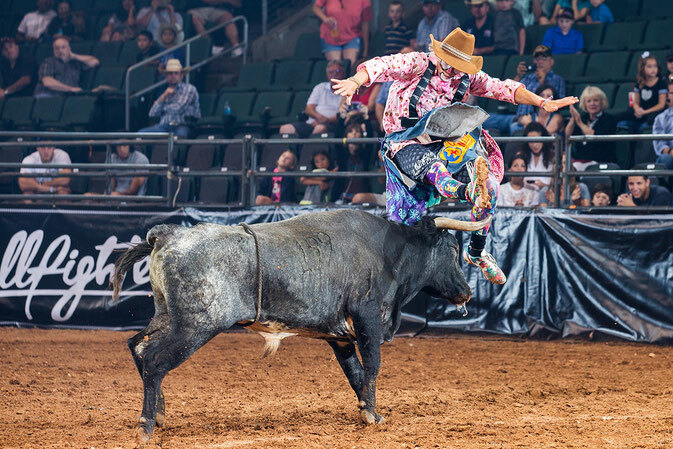 SAN ANTONIO, TX – May 12, 2016 – Founded by pro bullfighter Aaron Ferguson, Bullfighters Only (BFO) was created to promote growth, popularity, and acceptance of freestyle bullfighting worldwide. Since its inception, BFO has evolved to become a platform that serves to excite the western community, educate both the avid and casual fans, and present the sport to an entirely new audience. In a showing of solidarity, the top-ranked bullfighters in the world have formed an exclusive alliance known as the BFO Pioneer Project. Through this coalition, Bullfighters Only can ensure that the direction of freestyle bullfighting is guided by its athletes and guarantee its fans more action-packed entertainment from the sport’s greatest bullfighters. The talented group is fresh off of another successful BFO Session, an experimental action-sports style event that introduces a new flare to the western sports world. They are now preparing for the BFO’s first stand-alone title fight on June 26, 2016 at the Cedar Park Center - an 8,700 seat state-of-the-art arena near Austin, TX. Bullfighters Only will also announce partnerships to create a global qualification system that spans from amateur events to the World Championship. These partnerships will give non-BFO Pros the opportunity to become part of the current BFO roster and compete on tour. This system will also serve as a way for current BFO Pros to gain extra championship qualification points. 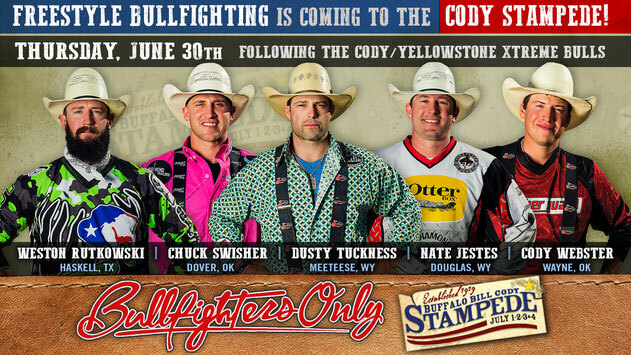 To stay up to date with all of the latest news, follow Bullfighters Only on social media or visit www.bullfightersonly.com.